When it comes to problems within the mouth, gum disease and oral cancer are two of the main players. However, recent findings are showing that there may be a connection between these two issues. We have long known that gum disease can cause health problems if it isn't managed and treated properly, and there is a good chance that oral cancer might be one of those conditions. During your dental visits, your dentist will conduct an exam of your mouth to look for a variety of things, including the signs and symptoms of oral cancer. Some of these include lumps or thickening of the mouth linings, colored patches, sores or ulcers that don't seem to heal, or pain in the tongue or mouth while chewing. If you smoke, drink heavily, or have excessive sun exposure to your facial area, you'll be at a heightened risk for developing oral cancer. Is Gum Disease a Risk Factor for Oral Cancer? Researchers have recently evaluated many studies, and all of them indicated that an increased risk of developing oral cancer will exist among people who have gum disease. 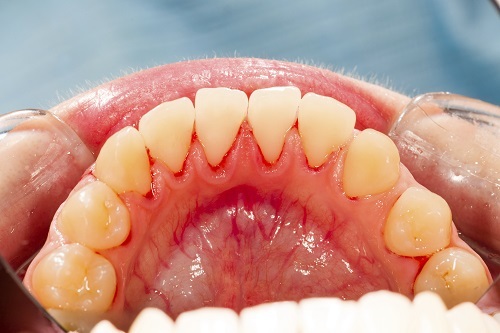 One study found that an increased rate of oral tumors was seen in patients who had 1.5 mm or more of connective tissue loss, while another found that the more teeth that were missing (usually as a result of gum disease), the greater a person's risk for oral cancer would be. It is important to remember that while advanced forms of gum disease might not be curable, it can be managed successfully. In fact, the health of your mouth really depends on your ability to manage the disease. If you have been diagnosed with periodontal disease, make sure you are following your dentist's treatment recommendations in order to keep your mouth healthy and minimize your risk of developing oral cancer. Please contact us if you have any questions about gum disease and oral cancer.